Bobby Akana was fishing in the P&R Ohana Shorecasting Tournament about 15 minutes from his home when he hooked his historic ulua. A clanging bell and screaming ratchet on his Shimano Torium reel woke Bobby at around 2 a.m. and the battle was on. He skillfully angled his fish to the base of a 70-foot cliff, then slide-gaffed it before climbing down and securing his catch with a heavier rope. Alone, he hauled the monster to safety. 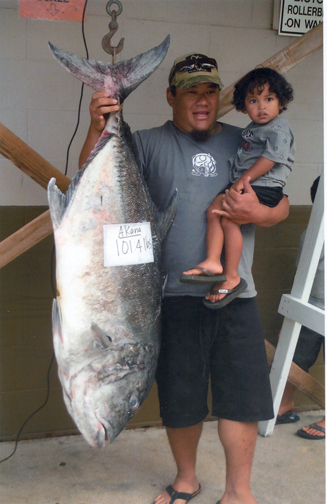 His 101.4-lb ulua took first place in the tournament.